Johan Cruyff, guru of total football, died on March 24, 2016 at the age of 68. He scored 33 goals in 48 appearances for his country, Netherlands. He won the European Cup multiple times as a player and then as a coach. He thrice won the Ballon D’Or, an award given to the best footballer of his generation. A select set of players has won it thrice: Zinedine Zidane, Lionel Messi, Cristiano Ronaldo and Michel Platini among them. Coleridge defines poetry both in terms of form and content. The best words indicate meaning and brevity, while the best order suggest form and structure. He thought it dull and prosaic if players and teams merely focused on the ends, that is just winning at all costs, which often meant the hard defending of a meager score of one goal, slowing down the game and engaging in all kinds of foul play. Cruyff believed that football could offer beautiful movement, rehearsed artistry and deft footwork without sacrificing on results – the scoring of goals. Cryuff’s exploits as a genius on the turf are legendary. He almost singlehandedly led Netherlands to the World Cup final in 1974, and earned his place among the footballing greats. But no other legend — not Pele, not Maradona, not Beckenbauer —contributed as much as Cryuff to change the way football is played. First as a player and later as a coach, he denounced the traditional kick and run football, which is still the staple at many English clubs. He often moaned that football players ran too much. Instead, along with Rinus Michels — coach of Ajax, Barcelona and the national Dutch team in the 1960s and 70s — Cruyff introduced a more delicate and artful brand of football based on passing, possession and intelligence. It came to be known as total football. Total football was about attacking defenders, midfielders who played deep and everyone playing in every position. The goal keeper was the first attacker and the central attacker was the first defender. Total football changed the nature of the game and how it was played. Cruyff believed that football was not about physical prowess or skill alone; he saw football as a game of brains. And his entire life was spent in proving this hypothesis. The crowning achievement of this school of thought has been the sweeping success of Football Club Barcelona in the first two decades of this century. Cruyff gave the process of playing football much thought. 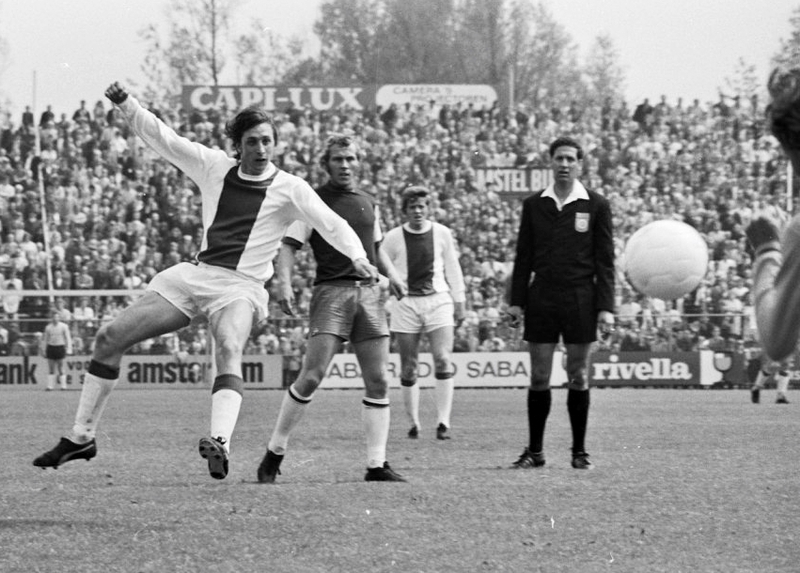 At Ajax itself, the combination of Cruyff playing on the field and Michels doing the thinking and organizing off it as a coach, helped their team win the European championship three times in a row in the early 70s. Later at Barcelona, Cruyff put total football into practice and is largely credited to have converted that club into one of the best teams in the world today. The style of “tiki-taka” or short, quick passes followed by Barcelona and later the Spanish national team is much Cruyff’s contribution. Its success has forced other teams, including current world champions Germany, to try to infuse some of these elements into their performance. Andrés Iniesta, Barcelona captain and a leading practitioner of the Cryuff philosophy, describes Cryuff’s philosophy in action. 1) Keep possession and frustrate the opponent: Every pass is important. A bad pass loses possession and puts the team under pressure. Short passes build momentum and if you have the ball then the opponents can’t do anything. 2) Think on your feet: If you think before your opponent where the ball is going to go then you have an advantage. If you stay with the ball at your feet and think about what to do, you are going to lose the ball. The best players are the quickest thinkers. 3) Defend when you are not attacking: When your opponent has the ball, close him down quickly. Put him under pressure before he’s even had time to think about an attack. 4) Space = time: Always be aware of who is around you: if you feel them closing down, take a touch to move the ball away from them. Try and put yourself in space to get the pass: the more space you have, the more time you have to think. 5) Brain over brawn: If I play against a big player, I play the ball quickly on the ground. Playing a quick one-two is also very effective as bigger players are slower to react and turn. I only weigh 63 kilos so I don’t have weight to throw around. If you can get the ball past them a few times using a one-two they will be more reluctant to rush in and tackle, so you have more space to play. To achieve the kind of success that Barcelona has, Cruyff emphasized the complete development of every player. Total football is not just a style of playing football where every player in the outfield can play in any position whatsoever; it is also about the development of the player himself into one who is physically fit, has the skills and also thinks about the game. To create such players, Cryuff proposed that Barcelona should set up a youth club similar to the Ajax Academy. His proposal was accepted in 1979 and the move created La Masia, Barcelona’s fabled youth academy. The success of Spain and Barcelona is heavily credited to the academy graduates, nine of whom form the core of both the Catalan and the National side. Lionel Messi, La Masia’s brightest star, often draws comparison to Cryuff for his grace, performance and development. In fact, Messi dedicated his fifth Ballon D’Or to the academy and wanted it to share it with the young inmates. Ironically, Messi is built unlike your typical heavy-set footballer. He is short-built and was physically frail when he joined the academy. 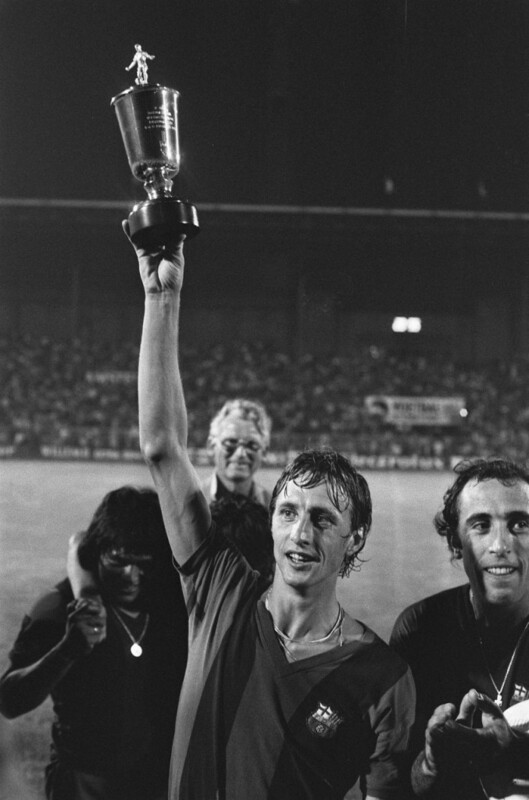 Although Cruyff is also identified with the famous “Cruyff turn”— where the attacker fools the defender into thinking he is hitting the ball ahead with the free foot, while flicking the ball behind the standing foot, turning the hips quickly in the other direction and running free of the defender, he never confused tricks with actual technique and the team nature, rather than individual brilliance, of the game of football. Cruyff’s contribution is all about life and living. Football after all, for Cruyff, was all about time and space, and isn’t that what life is all about too? Cruyff’s focus was always on process, and about enjoying that process. About total football, Cruyff says that we just played football which the world loved. The question we asked everyone including the spectators and supporters of the opposite team was: did you enjoy? Not a very big-built guy himself, Cruyff did not worry that he did not have what was required to become a success in the game. The ultimate martial artist, he quickly converted his weaknesses into strengths. He took what he had, built on it and achieved greatness. And then he went on to remark that for most people the game was about having the ball and what they did when they got the ball. His counter-intuitive thinking was at work here too. It is what you do when you do not have the ball that defines you as a player according to Cruyff. The Johan Cruyff Foundation has helped raise money and resources to create Cruyff courts, which are small-size football fields suitable for seven-a-side game – and are an alternative to the disappearing public playgrounds because of urbanization and over-development of land into buildings. There are now more than 200 Cruyff courts in more than 20 countries; and are especially beneficial to children living in deprived neighborhoods, where street football was popularly played at one time but has now stopped for various reasons associated with our cities today. Yet it is a rich legacy that Cruyff leaves behind. It is not just the legacy of having scored goals or won championships. He has developed and implemented a philosophy of football, implemented it and seen it bring glories to his club and to his adopted country of Spain, nurtured young talent, and created playing spaces for poor children throughout the world through the Cruyff courts. 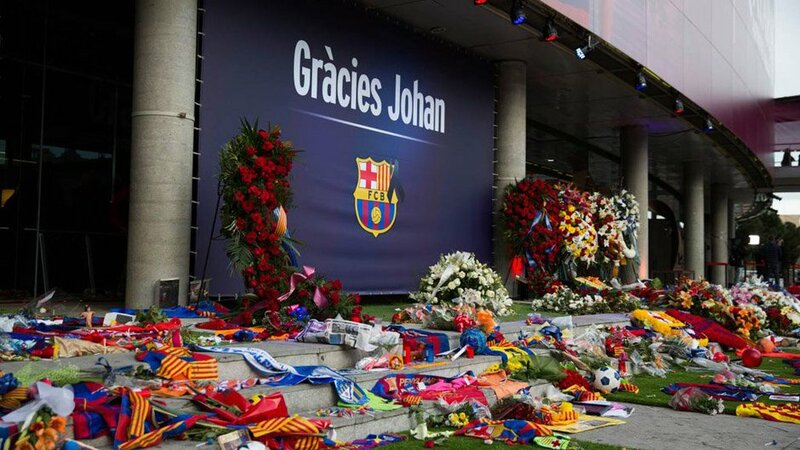 He is not just a total footballer – Cruyff is a toal and complete human being.